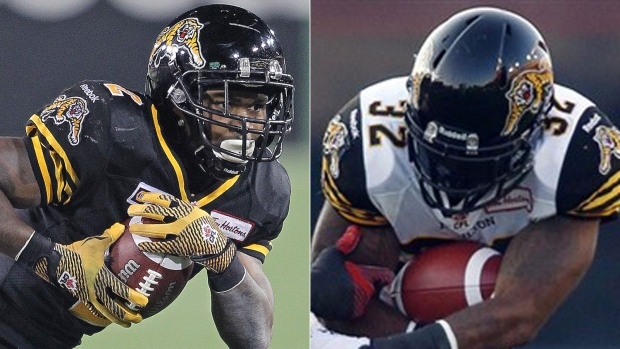 The Hamilton Tiger-Cats will have a talented yet crowded backfield next year. One day after announcing they have signed international running back C.J. Gable to a contract extension that will keep him in Hamilton through 2017, the Tiger-Cats announced 2014 East Division All-Star Nic Grigsby has also been re-signed. In two seasons in Hamilton, Gable has complied 160 carries for 920 rushing yards, an average of 5.8 yards per carry, and nine rushing touchdowns while hauling in 72 passes for 822 yards and seven receiving touchdowns. "C.J. is one of the league's best all-purpose running backs. He's a versatile player that is a strong runner, great blocker and solid receiver out of the backfield," said Ticats general manager and head coach Kent Austin. "We're thrilled to have him back in black and gold for years to come". Since signing with the Tiger-Cats, the 2013 East Division All-Star and Most Outstanding Rookie has registered 100-plus combined yards in 10 of his 21 career starts. Grigsby joined the Tiger-Cats late last season after he was cut by the Winnipeg Blue Bombers. In 17 starts (three with the TIcats) Grigsby record 890 rushing yards and nine rushing touchdowns, and added 58 receptions for 473 yards and a touchdown.